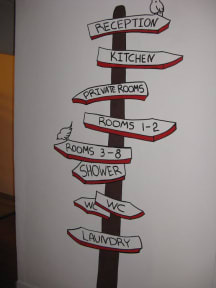 Hostel Ibex is located in the most tourist place in the city, Prague 3 - Zizkov. The hostel is located in a historic building, built in the early twentieth century. From the windows of the hostel you can see the historic building of Prague's main train station, which is 5 minutes from the hostel. The very favorable location of the IBEX Hostel allows guests to walk to the main sights of the city of Prague. Near the hostel IBEX is a large number of bars and restaurants, shops. The main station of the city is 5 minutes, Wenceslas Square is 10 minutes, Palladium shopping center is 7 minutes, Stromestkaya Square is 15 minutes. 100 meters from the hostel is the School of Economics in Prague. The second suburban station (Masarykovo nadrazi) is 5 minutes away. Florenc Bus Station is 8 minutes from the hostel. The tram and metro stop (red line C) of Hlavni nadrazi is 5 minutes from the hostel. The interior of the hostel will show you the main sights of the Czech Republic. In summer hostel will offer you a cosy place for rest in the courtyard of the house. Large selection of crafted beer from the best brewers in the Czech Republic. Possible delivery of food to the hostel. Kitchen-dining room, sitting area, computer and printer for guests. 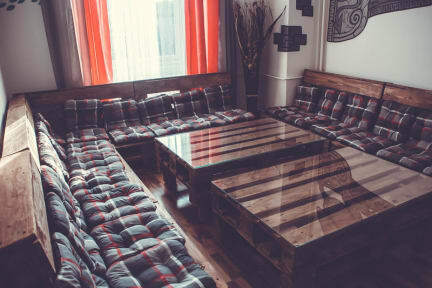 The rooms of the hostel are equipped with new furniture (made from wood). The rooms have a private bathroom and toilet. The hostel has rental bicycles and cars. The hostel offers luggage storage-free of charge! Possible car parking! O banheiro estava bem sujo, mesmo após a limpeza. As roupas de cama pareciam que não eram trocadas já tempo, tinha pelos, cabelos e sangue no meu lençol e edredom. O pior de tudo é que tinha percevejo no meu edredom. Só me dei conta na segunda noite, quando comecei a ser picada. Não quis reclamar pois já estava indo embora e os staffs não eram nada cordiais. It's a nice hostel for sleeping and leaving the stuff, not all the staff is friendly, but there's a nice environment, the cleaning is ok.
A recepção foi ruim, o cara respondeu grossamente algumas perguntas e pedidos de ajuda. E além disso, as meninas devem tomar muito cuidado na hora de escolher quartos mistos. Café da manhã péssimo. Pagamento somente em dinheiro e bastante confuso. Complicou bastante a troca de dinheiro.